It’s like a set piece from a movie: the wives of two famous enemies meet, gossip about their estranged husbands, and have a lovely time together, ending in the singing of a Mozart duet. Such was the scene in the Swiss city of Bern on September 23, 1814, when Princess Caroline of England visited Empress Marie Louise of France. 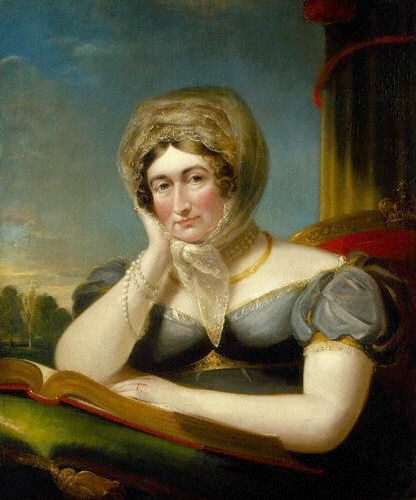 Caroline was the lusty, eccentric 46-year-old wife of England’s Prince Regent, the future King George IV. George had reluctantly married Caroline – his German cousin – in 1795. He fathered a daughter (Charlotte) with Caroline. He then began living apart from her. For details of this unhappy union, see “The Strange Marriage of the Prince Regent and Princess Caroline of Brunswick” on Jane Austen’s World. Marie Louise was the 22-year-old second wife of Napoleon Bonaparte. At the time, Napoleon was in exile on Elba. 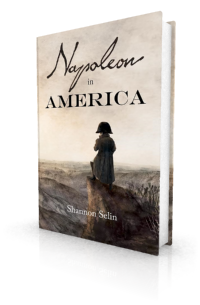 Napoleon was hoping that Marie Louise and their three-year-old son, Napoleon II, would join him, but Marie Louise’s father, Emperor Francis I of Austria, would not allow it. Instead, Napoleon had just received a visit from his Polish mistress, Marie Walewska, and his illegitimate son Alexandre. Marie Louise didn’t know about the visit, but even if she had known, she may not have much cared. She was finishing up a holiday in the company of Count Adam Albert von Neipperg, her consort in Napoleon in America, who had just become her lover. When Caroline joined Marie Louise the next morning, she spoke “with biting directness” about the difficulties she had experienced in England. Marie Louise asked about Princess Charlotte. Marie Louise, who had recently learned of the death of her grandmother, Queen Maria Carolina, was dressed in black. After offering condolences, Caroline expressed the fear that she would soon be obliged to wear mourning for her husband, whose infirmities grew every day. The two hit it off so well that Marie Louise returned the visit that afternoon. She invited Caroline to join her for dinner. The evening was reportedly a jolly one. Caroline spoke with enthusiasm about the pleasure she hoped to experience on her trip to Italy. She mentioned that she might go and visit Napoleon on Elba. Marie Louise asked Caroline to sing some Italian arias. The latter consented, but only if Marie Louise would sing with her. They sang the duet “Là ci darem la mano” from Mozart’s opera Don Giovanni. Marie Louise took the part of Zerlina, and Caroline that of Don Giovanni. Count Neipperg accompanied them on the piano. Caroline and Marie Louise never met again. 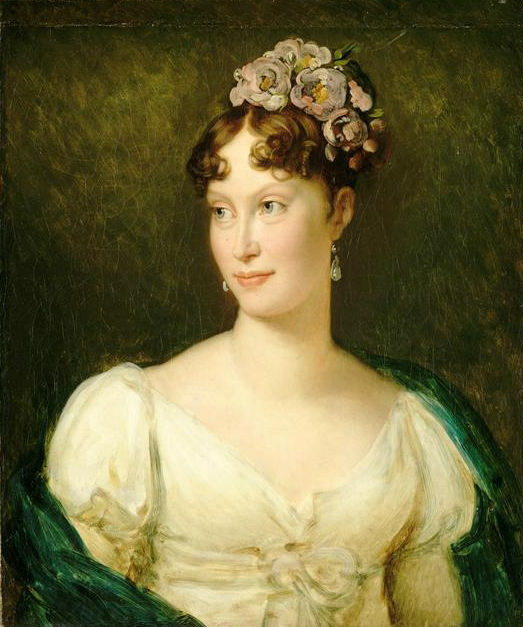 Caroline died on August 7, 1821, at the age of 53, three months after the death of Napoleon. Marie Louise married Neipperg. She died on December 17, 1847, at the age of 56. Click here to see a photo of Marie Louise taken earlier that year. Louis François Joseph de Bausset, Mémoires anecdotiques sur l’intérieur du palais et sur quelques évenements de l’Empire, Vol. III (Paris, 1828), pp. 54-55. Claude François Méneval, Napoleon et Marie-Louise, Vol. II (Paris, 1845), p. 294. Mémoires anecdotiques sur l’intérieur du palais et sur quelques évenements de l’Empire, Vol. III, p. 58. Fascinating article. Thanks for sharing this with us. Thanks, Christoph. I’m glad you enjoyed it. Nice article on a set piece of Napoleonic history that I had not previously been aware of. Thank you Shannon! My pleasure, Gary. Glad you liked the article. Great article, thanks Shannon. Clearly the women were as different as chalk and cheese but for a moment they found something in common. Thanks, Julia. That’s well put. Given what they had both been through with their arranged marriages, it’s rather nice they had the chance to enjoy each other’s company. Always interested in the by-ways of history. I’ve just read that Napoleon sometimes beat Josephine. Is this accurate? Not that I’m aware, Jane. I am a fan of all royal history. Polite and cultured society, in contrast with warfare. 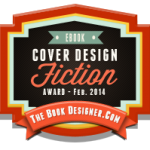 Yes, it’s a nice break from the battlefield tales. Despite her clothing and appearance, which one could frankly call bizarre, the Princess of Wales had the air of an excellent woman, simple, frank and putting everyone at ease.